Today let's visit the blog of Sharon Hinck who writes "stories for the hero in all of us." 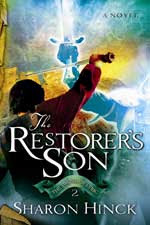 Sharon is the author of a new fantasy series called The Sword of Lyric (NavPress) with Book 1 - The Restorer already published and Book 2 - The Restorer's Son coming September, 2007. This looks to be an exciting series. For more information on the tour, visit The Fantasy Fiction Tour. And look for reviews of Sharon's books at Christian Science Fiction & Fantasy Blog Tour. Also: Associated Press gave the tour a brief mention in their series Everything Sacred. Sounds like an exciting fiction - thanks for sharing!